You may well think that it was with the Gameboy that Nintendo gained a strangle hold on the hand held videogame market, but they were doing very well before it was released with the Game & Watch range. The idea for Game and Watch came from Nintendo designer Gunpei Yokoi (who incidentally also came up with Gameboy) who saw a bored business man playing with a pocket calculator whilst sat on a bullet train. 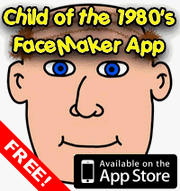 Realising that a pocket sized electronic game could be a big seller he came up with the first in the series, called Ball, which was a juggling simulator! 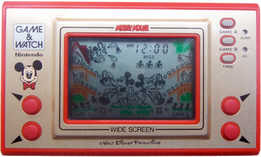 The original Game & Watch games consisted of an LCD screen and a number of buttons for playing the game. The LCD screens had all the graphical elements required to animate the game mapped out on them, and the games logic circuits just switched the different elements on and off as necessary. Any permanent parts of the display were printed directly onto the screen, yielding a little colour to the proceedings. Later models added extra screens and the now famous cross shaped D-Pad which Nintendo have used on just about every gaming system ever since! Whilst the games were fairly simple in structure they were a lot of fun and quite a test of skill as most got faster and faster as your score climbed higher. Many games even had two variations, labelled Game A and Game B, although Game B was normally just a harder version of Game A! Nintendo used a variety of different characters in the Game & Watch games. The first games tended to feature a little bendy stick man who was named Mr. Game & Watch, but later games such as Donkey Kong and Mario’s Cement Factory featured some of Nintendo’s better known creations. As well as their own characters Nintendo also created some licensed titles, including my first introduction to the range, Disney’s Mickey Mouse, which my sister received as a present. This game involved Mickey catching eggs which rolled down ramps in a little basket. Interestingly the game itself was a reworking of an earlier title called Egg, which instead featured a wolf collecting the eggs. Other well known characters to be given the LCD treatment were Popeye and Snoopy, who appeared in Snoopy Tennis. Charlie Brown threw balls at Snoopy who had to hit them back by climbing up and down a tree! In all there were 59 Game & Watch titles released (sixty if you include a special edition yellow version of Super Mario Bros which was produced as a competition prize) with the first coming out in 1980 and the last in 1991. Nintendo did also release some Gameboy Color and Gameboy Advance adaptations of certain Game & Watch titles. If you want to learn more about the range of Game & Watch titles that were available then pay a visit to the Parachuter website. This entry is filed under Toys - Videogames	and was posted on September 25th, 2009. You can follow any responses to this entry through the RSS 2.0 feed. You can leave a response, or trackback from your own site. Where did you find my game? I wondered where it went. I hope you didn’t pinch it off me cause I know it was suppose to be mine. I use to love that game. I use to play for hours. I WANT IT BACK!!!! He’s had it for years and been hoarding it….. I had Donkey Kong jr and the brothers had Mario Brothers. No, I found the picture of it on the Internet sis, it’s not a picture of your one. I assumed you still had it somewhere, I hope you still do because it was very addictive and I’d love to play it again as well. Woah – I’ve been looking around my old things for stuff to sell on Ebay, and I’ve discovered my old “Game and Watch” handheld is now highly regarded! So, the question is Denn City, are you still going to put it on eBay?